This large “L” shaped kitchen was desperate for a makeover. The homeowner’s had recently replaced all the flooring throughout the house with bamboo. The dishwasher broke down and in order to install a new one, the tile edge had to be removed. This made them realize it was time to remodel the kitchen and get state-of-the-art appliances, cabinets, countertops and lighting. In short, remodel the kitchen and laundry to create their dream space. After meeting with this couple, I wanted to create a casual yet fresh space that is both elegant and inviting; will function for special occasions and on a daily basis. The first thing we discussed was the functional aspects. It was obvious that the sink needed to stay where it is under the large window. But the existing cooktop in the peninsula was not ideal, nor was the long distance between the refrigerator and sink. The husband and wife like to cook together most evenings. They also like to entertain. I prepared several schematic plans for review. After many discussions, this plan was approved. We visited several showrooms for cabinets, granite slabs and tiles. The cabinet style, as well as the functions offered by different manufacturers was reviewed. The Shaker style in an off-white paint finish was chosen. The cabinet plan includes a trash pull-out, Lazy Susan’s in the corners, and a pantry unit with roll-out shelves. The existing soffit around the perimeter was eliminated in favor of tall wall cabinets for additional storage. The new dishwasher has a matching cabinet face. The cabinet doors and drawers have the soft closing feature. Professional grade appliances in stainless steel complete the transformation. The cabinet pulls are a contemporary bar of stainless steel. The sink faucet and the pot filler also have a stainless finish. The peninsula was enlarged to accommodate seating on the end and extends over a wine cooler next to the sliding door. The selection of the countertop color will impact the total design. Slabs of quartzite granite, with a beautiful veining of dark gray and blue-green, was selected for the countertops. 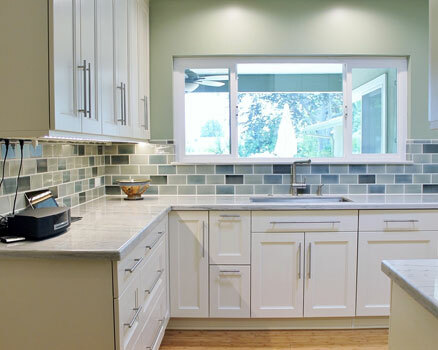 The back splash was designed using tile in a hand-made subway shape. The 3 colors of gray and blue-green are laid in a loose pattern. These colors envelope the space and pull the room together. The tile feature below the hood is a classic Moroccan pattern with a dark pewter frame. Three shades of gray/green paint are used; the lightest shade is on the ceiling. The kitchen walls are a deeper shade with a slightly lighter shade used on the laundry walls. The laundry area was behind bi-fold doors, but did not function very well. By stacking the washer and dryer, space for a new base cabinet with a deep sink was created. A wall cabinet provides storage for the cleaning supplies. The mops and brooms are organized on a wall bracket. A new LED ceiling light was added. New, wider bi-fold doors were installed. The solid exterior door was replaced with a glass door to bring the outside, in. To address the lighting issues, new LED recessed cans were added as well as 2 solar-tube units with LED lights. The ceiling in the room in front of the laundry area had a lower ceiling. This ceiling was removed resulting in a new ceiling that is about 10” higher, but not level with the rest of the kitchen. A new soffit drop makes the transition between the 2 ceiling levels from which a decorative green glass pendant light is suspended over the peninsula. The transformed kitchen and laundry is now functional and inviting for a simple meal or entertaining a group.